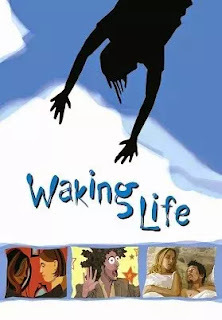 Before dreams within dreams in "Inception" (2010), and Linklater's other rotoscope animated film "A Scanner Darkly" (2006), there was "Waking Life." A film about lucid dreams and conversations ranging from the philosophical to the existential. In fact, the entire film takes place within a lucid dream state. As such the film jumps, flies and morphs its way through random, often abrupt, interactions with other people, all of whom seem to be right in the middle of discussing some random, but deep thoughts on existence, consciousness and humanity's place in time. They all, on some level, seem to be trying to figure out the difference between waking life, and the world of our dreams. What world are we really seeing when we are dreaming, and is it another reality, or another dimension altogether? And just what exactly is consciousness? Before we realize just what Linklater's doing with this film, things feel rather disconnected, and abrupt. In a sense, the film feels like Jim Jarmusch's Coffee and Cigarettes (the various scenes of which were shot over a 17 year period) that presented a collection of unconnected, comical sketches where famous faces meet over coffee and cigarettes to discuss anything and everything. However, rather than comedy, Linklater presents thoughtful, didactic scenes. But as the conversations start turning toward consciousness, and lucid dreams the unnamed main character (Willy Wiggins) begins to realize he's still dreaming. After waking up, he rolls out of bed, splashes water on his face, rubs his eyes, and realizes he's still dreaming. There's a scene in which he and another dreamer discuss the fact that in dreams you can't turn on or off lights in a room. If they're already on, they'll stay on if you flip the light switch, and if they're off you won't be able to turn them on (or by setting the idea in his mind, did he just change the rules of the dream?). When the main character attempts to flip the switch in that room, of course, he realizes again, he's still dreaming. He can't tell how many dream layers deep he is, and starts to wonder if he's dead. Suddenly all the existential questions, and philosophical discussions make sense. It shows us the deep, thoughtful mind of the protagonist, while commenting on the predicament his consciousness is in. Linklater's rotoscope animation feels like an inspired choice with which to capture a dreamworld. Involving normal shooting with a camera, only to be animated over later, it's a literal distortion of reality. At times it's devoid of color, others it's bright and vibrant. There's an odd movement to the animation giving it the look of water. As if we're peering into images displayed on a wavy pool. Fittingly there's a scene early on in which, just as I was thinking this, a boat/car (or is it car/boat?) pulls up, driven by a man shouting "ahoy!," while wearing a captain's hat. There are many such instances where, within the writing, the film feels like a commentary on itself. It impresses itself on us in such a way that we begin to feel like it's our dreamworld. Once I start imagining the things being discussed, the images begin animating next to the person speaking. And later on, scenes involving two others discussing philosophical thoughts are seen as if displayed on a theater screen, with the protagonist sitting in the seats below, an obvious attempt at making the scene play out through our eyes (particularly effective for anyone viewing the film in a theater). There's enough food for thought to chew on for days presented from scene to scene. Obviously, the main character is a well studied, and thoughtful person to have dreams involving such conversations. But then again this is the assumption Linklater's willing to place on us the viewers, as he's so intent on making this our film. Yet it also partly feels like Linklater's dream. This film was made and released in between "Before Sunrise" (1995), and "Before Sunset" (2004), yet it features Ethan Hawke and Julie Delpy reprising their roles in a scene that couldn't have happened outside of a dream. And Linklater himself pops up toward the end of the film as a pinball player who encourages us to wake up. It makes sense when considering an earlier scene that told us that in dreams we are experiencing ourselves apart from our physical body. This being a quite literal representation of that idea, if indeed this is one of Linklater's dreams. I have a lot respect for Richard Linklater. He's one of the most thoughtful directors working today. Rarely does any other director infuse so many thought provoking ideas about life into a script. He's also turned in a terrific filmography so far. He's more than proved himself a creative director willing to think outside the box, or draw outside the lines (another commentary given visually in this film). His "Before" series played around with the idea of returning to characters years apart, an idea he took to the next level with his Oscar nominated 2014 film Boyhood. He's proven he can handle anything from commercial films, to quirky comedies, and experimental indie films. It seems no matter what type of film Linklater sets his mind on, he's going to create something beautiful and engaging. With this film, and his 2006 film "A Scanner Darkly," he's proven himself capable of visually stunning animated work. 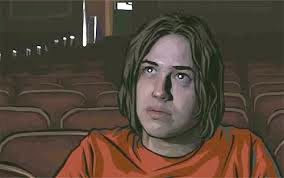 I suspect that if Linklater were to do another animated film it would also be rotoscope animation, or another unique method producing a visual element foreign to mainstream film. For that I respect him even more.